You are currently browsing the tag archive for the ‘metalwork’ tag. As you can tell by the images in this post, I am enamored with Tower Falls. 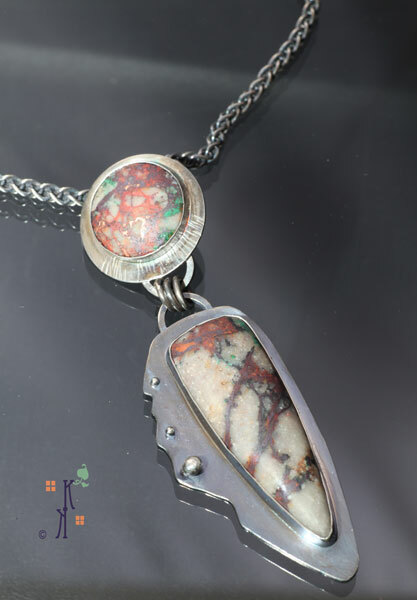 The Dendritic Opal stone in the Treescape pendant, captured my attention at this year’s Gem & Mineral Show in Denver. 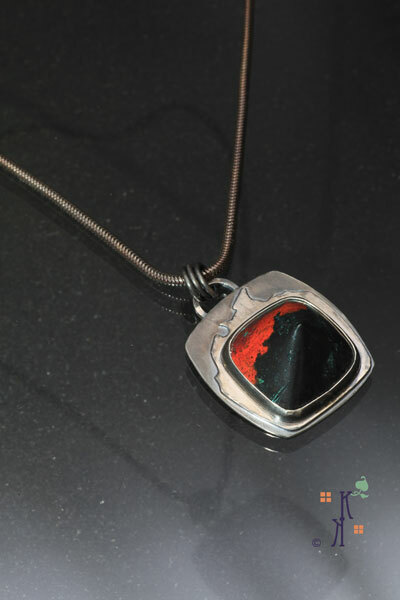 The stone is fairly large and I have found that most woman are more comfortable wearing smaller art jewelry pieces. When I bought this piece, I knew I would make something in my Treescape series to add to my personal collection. The stone by itself was simply stunning. It wasn’t until it was completed that I saw the representation of Tower Falls from Yellowstone National Park in it. I thought it would be fun to share Dan’s photo from one of our trips to Yellowstone of this magnificent waterfall. We have visited Yellowstone National Park a number of times and I always look forward to going back. When Dan took this photo, he hiked up a bit to get just the right angle. It’s one of my favorite photographs and hangs in our home. This stained glass window is one of my original works base on Dan’s photograph. It’s a little difficult to tell from this photo but I did add some 3D affects by floating parts of the aspen leaves over the base image. As I look at this window, which I completed about 3 or 4 years ago, I can see a number of things I would do differently. I had some really nice glass to help with the waterfall and pool area. I guess it’s normal to think about how we would rework some of our older works. I do wonder what it is about Tower Falls that keeps calling to me. I love water, the sound, the feel, the tranquility and churn of it. I’m certain one day I will understand why this waterfall keeps reappearing in my life and work. 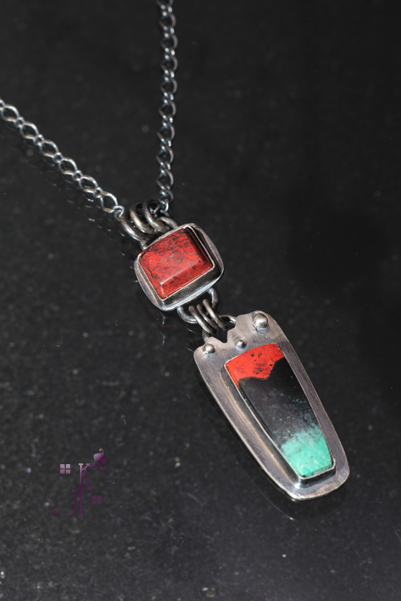 I’m still capturing my thoughts and experiences from the Colorado Metalsmithing Conference last weekend. Thankfully, as I have journaled about these here, I have found some of the clarity I wanted to achieve. From some of the feedback on these posts, I think the rest of you are enjoying this journey too? 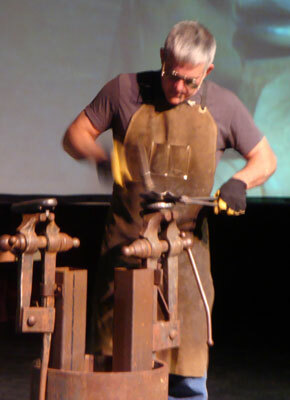 Hoss Haley was another one of our speakers and he is a blacksmith, an extremely talented metalworker artist. There were so many things that impressed me about Hoss. As he talked about his background, growing up on a farm in Kansas and how over the span of 20 some years he has grown as an artist, I was struct by his innovation, creativity and resourcefulness. I know I related to him as well as I did because of my background. My mom grew up on a farm. Her father was a blacksmith. From my mother’s descriptions of life on a farm, you just had to be self-sufficient. If you needed something, you made it, grew it, did whatever was needed to get it or just did without. When my mom was a child, there wasn’t a Wal-Mart Superstore 5 minutes down the road to go to and get what you needed. This philosophy of do what you need to accomplish the task at hand is clearly first and foremost in Hoss’s mind. He has built several hydraulic presses, his last one exerts 100,000 tons of pressure, and he uses it to form the larger components of his public art works. He’s looking to put together the components to build a new hydraulic press that exerts 200,000 tons of pressure! Wow, imagine what he will do with that one. He showed a video of one of his smaller presses in action, it was automated and all Hoss had to do was move the metal around as the press moved up and down on the surface. Besides being awe struck by what the press did, seeing it in action I kept thinking, keep your fingers and hands out of the way! He initially apprenticed with Tom Joyce and his work was greatly influenced by him. Yet he recognized that he needed to radically change up what he did as an artist in order to have his own individuality. He has definitely done this. 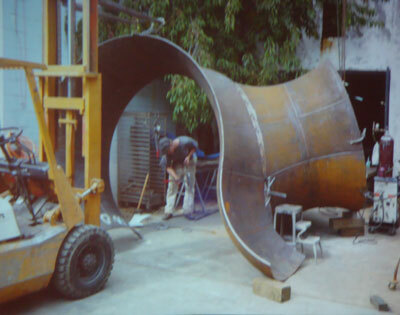 He said that he started looking at these huge sculptural works, public art works, and thought, I can do this. He just needed a way to build things on that scale. Here was one of the prime examples of his innovation, creativity and resourcefulness that he had learned growing up on a farm. He broke his design ideas down to their smallest components. That is why he would build these presses that could forge the metal in sections. He would take these sections and piece them together as you would a jig saw puzzle. It all came together, a little bit at a time. If he can’t find what he needs he builds it. He created this one machine that calculates pi and uses this in some of his designs. It is an arm that pivots, with a pen attached that draws these circles based on the latest pi calculations. Each one is different and as random as the calculations. Every time he starts it, it starts in a different position base on where the calculation starts. Awesome stuff folks! Again, he was looking for a machine that did this and didn’t find one out there that would do what he needed….he built it! This guy is really super smart, innovative. Hoss was one of the presenters who did a demo after his talk. 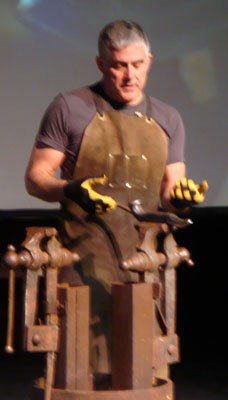 In preparation for this demo, he worked up a couple of forming stakes to use and brought them to the conference. He was showing us how he would form a pear, even down to the detail of how he did the leaf. Imagine, creating a couple of rather large forming stakes just so we could benefit from watching him doing one aspect of his work. That was terrific! And you can definitely tell that Hoss still wields a hammer on a regular basis. The man has ‘guns’ and he got them from hard work, NOT steroids!!! He even does a bit of jewelry and small sculptural pieces (like that pear) that are available through galleries. However, I think he is best known for his large sculptural works of public art. The point he drove home for me was we are an accumulation of all aspects of our learning experiences. Going back to the days on the farm and his progression of his artistic journey. Innovation, creativity, and resourcefulness….each of us possess those qualities. Be mindful of them and just think of the possibilities! How exciting is that? On top of all of this, he has a great sense of humor. I truly believe he is humble about his work and all he has accomplished. It was really energizing to listen to Hoss. What in the world is a flat fid burnisher and why do I use this in my metalwork? It’s is a tool that is used in the fabrication of stained glass windows. Prior to becoming a metalsmith, my artistic journey took me down the path of being a stained glass artist. I still love the medium and currently, I do a very limited number of stained glass projects….mainly for our home. Every medium has its tool set and this burnisher has migrated its way to my metalsmithing tool box. Its original purpose was to smooth (burnish) copper foil onto the individual glass pieces that make up the stained glass window’s design. When doing stained glass windows in copper foil, each piece of glass is wrapped in sticky backed copper foil. The foil must adhere to the glass and to ensure that it does so, a burnisher is used. The tool is used to rub the top of the copper foil onto the glass, eliminating little bubbles and making sure the contact seal is good. When done properly, the foil is secured to the glass in preparation for soldering the pieces together to form the window. There actually are several different types of burnishers for that type of glass work and I have a mixture of them. However, I found this one to be particularly useful in my metalwork. I use it to help form bezel strip around stones that I set. Because it is plastic, it doesn’t mar the metal. It works better than my fingers because it is stronger. At the starting point of the bezel strip, I will work the bezel around the stone, hold the wire strip in place with my fingers of my left hand (I’m a righty) and use the tool to gently ease the bezel around curves and corners. When I’m done, I have the stone shape outline in the bezel…just what I wanted. Sometimes after I’ve soldered my bezel strip together, it’s out of shape from the original shape of the stone it will hold. Another opportunity to use the tool here…. I position the misshapen bezel around the stone and use the fid burnisher to straighten and reshape the bezel strip to the stone shape again. This also helps me to ensure that my bezel outline is right before its final soldering into place on the back plate of the setting. You can’t really fix a misshapen bezel once it’s been soldered down on the back plate. One thing I have found, and hopefully you have too, is that some tools can safely be used for another purpose beside the original one. Lexi is a great advocate of this principle. She has found lots of things that she will use in her studio, that are outside of their intended purpose. Take one of her classes for those tips and tricks! Experimentation, within reason, is a good thing. 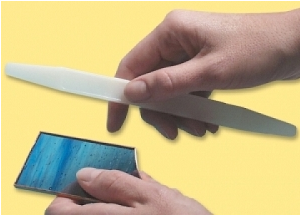 You can find the flat fid burnisher at your local stained glass supplier, if there is one in your area. Call ahead and make sure they carry them. Of course, there are many online sources for them too. They are relatively inexpensive, ranging from $1 – $3. I found one similar to mine at All Stained Glass for $1 and another at a mid-range price ($1.80) at Harmony Stained Glass. However, All Stained Glass has a $35 minimum order requirement, while I don’t think Harmony requires a minimum order amount. Delphi Stained Glass is another resource too. If you are considering adding one to your toolbox, in this case I would encourage you to shop locally and avoid shipping costs and/or minimum order requirements. Just my thoughts. This is a tool I use every time I prepare my bezel strip for the stone setting process. I’ve tried using the handles from tooth brushes, but their handle shapes don’t work as well for me as the nice edges and curves of the fid. I hope you found this segment fun and insightful. 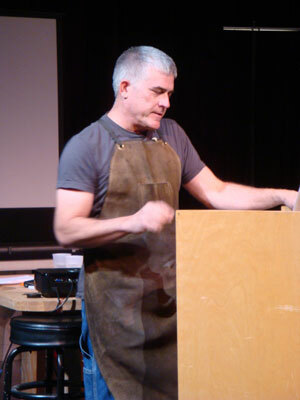 What tools do you have in your metalsmithing shop that were not originally intended for metalwork? Pictured are my medium and large Wubbers Bail Making Pliers. I purchased these when I was wire wrapping my glass cabochons. They also have a smaller sized one, but I felt it was too small for the bails I would want for my work. I liked a number of things about them and still do. They provide a way to consistently shape a bail. The handles are slightly cushioned so they are very comfortable. I discovered them when I was reading a wire wrapping magazine and caught Wubbers ad. They looked perfect for the job of making bails and I can confirm that they are. I purchased these from FDJ Tools on Time. 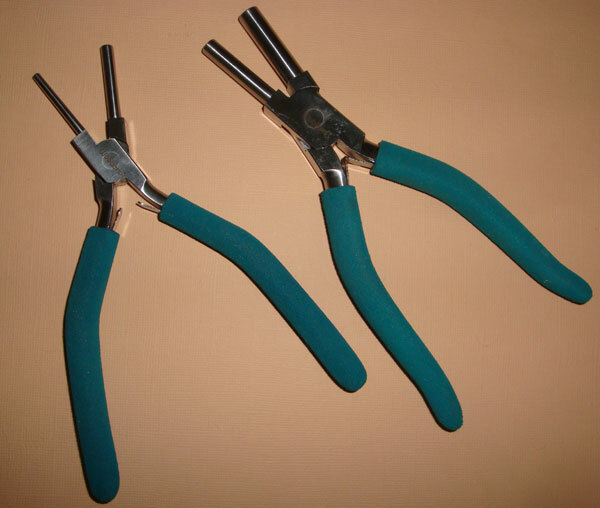 Of course, my favorite resource for finding things on the web is Google, so feel free to do a search and you will find that there are a number of distributors for this line of pliers. Now that I don’t work with wire as much, I find that I still use these for shaping some of my metal bails. As long as your metal is properly annealed, I find they are a great asset for bending and shaping the metal into bails. The different diameters work great to create a bail that is just the right size for the chain I like to use for my necklaces. Since I have used these for a number of years, I find they are durable and a good value. Of course, they have a very specific purpose, they are not a tool I use everyday so they don’t get regular wear and tear…more like gentle wear and tear. Wubbers has a nice product line and I have found their website easy to navigate. Although these are my only set from Wubbers, given my experience with these, I would definitely consider purchasing some of their other products when the need arises. If you are in the market for a nice set of pliers to create bails for your pieces, give these a try…I think you will like them. Life has its challenges, doesn’t it? I think I’ve been fortunate because I believe I learn and grow from these challenges as they are presented. For me, this piece symbolizes the challenges that life presents and with all the mountain shapes in this one, I just felt it echoed the challenge to “Climb Every Mountain“. Maybe a bit of the Sound of Music is resonating with me too. Yet, I think that mountains, in all their rugged beauty, beckon us and present challenges for those adventurous to dare. If we are honest with ourselves, isn’t that part of what life is all about? The challenges and how we respond to them? Can you tell I think there is A LOT of symbolism in this piece? The stone is another beautiful Sonoran Sunrise I acquired from Gary B Wilson. 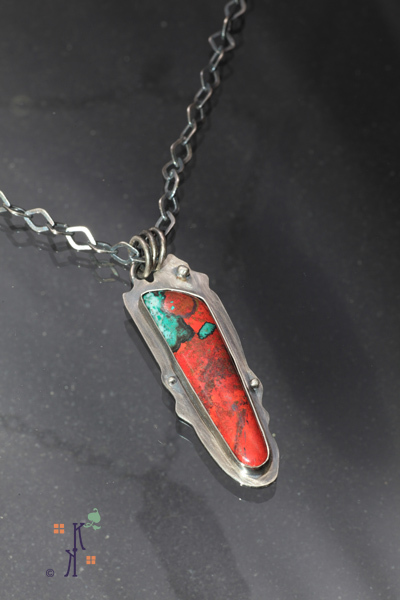 It is set in sterling silver that I’ve oxidized to create additional depth. I wish I could report that I have achieved my February goal of completing 25 pieces in my Mountainesque Series, however, I do have 10 completed pieces. You see, February had a few challenges in it for me and sometimes ya just gotta roll with it. To my way of thinking, I have 10 pieces done and more in my sketch book. I will continue to debut them here. Stay tuned, I think there are some real beauties in this series. Hope you enjoyed reading about the symbolism of this piece. Do any of you have any work that symbolizes something so strongly for you? I know some of you definitely have those pieces in your body of work. I’d love to know your thoughts. Another in my Mountainesque Series. The stone is a pyramid shape, Sonoran Sunrise, that I purchased from Gary B Wilson last year at the Denver Gem & Mineral Show. I really loved the ‘scene’ in this one. It reminds me of a lava flow, right after the volcano has erupted. The churning, the flares of the lava as it flows over everything in its path. Powerful. This presented a photographic challenge for Dan because of the depth of the stone and its shape. I hope you can see the scene that I replicated in the overlay of this setting to compliment and emphasize the drama I see in the stone. Why call this one Vulcan? Well, no matter what direction my thoughts went, I kept coming back to the name and its relationship to volcanoes. I actually found an interesting commentary on University Today that discussed the mythology about the Mediterranian Island, Volcano. After reading that, I thought it fit for me and decided on Vulcan for the title of this piece. I used Sterling Silver for the back plate and shaped overlay component in this setting. 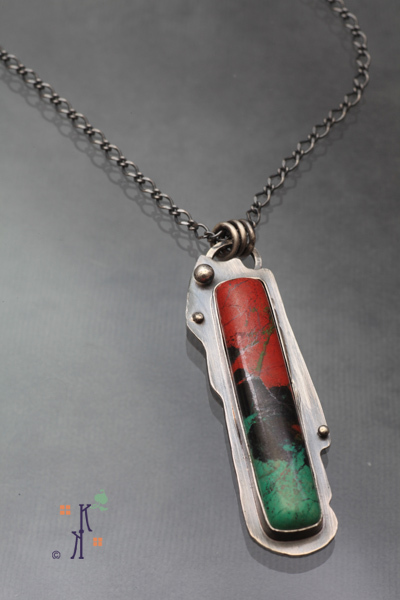 The piece was oxidized with liver of sulphur; my design called for the removal of the oxidation from the overlay to further emphasize the shape and depth. Time to get back to my bench and work on more in this series…I have 5 more designs in this series waiting for me to get busy! There are times when all of us experience that feeling of “stuck”. The block to our creative channel. It’s frustrating. When I have it, I refuse to move forward. I know the right thing will come to me. With this piece, I had the top figured out pretty much from the get go. But that bottom portion of this one, taunted me for longer than I care to admit. The design for Beginnings happened in that flurry of the creative spurt when Mountainesque became a series. I knew I was on to something. And I must give credit to the stone too as I FINALLY saw a mountain range in the lower stone that became the inverse of it in the metal. That is why I call this one Beginnings. It helped me along the way to the beginning of my Mountainesque Series. 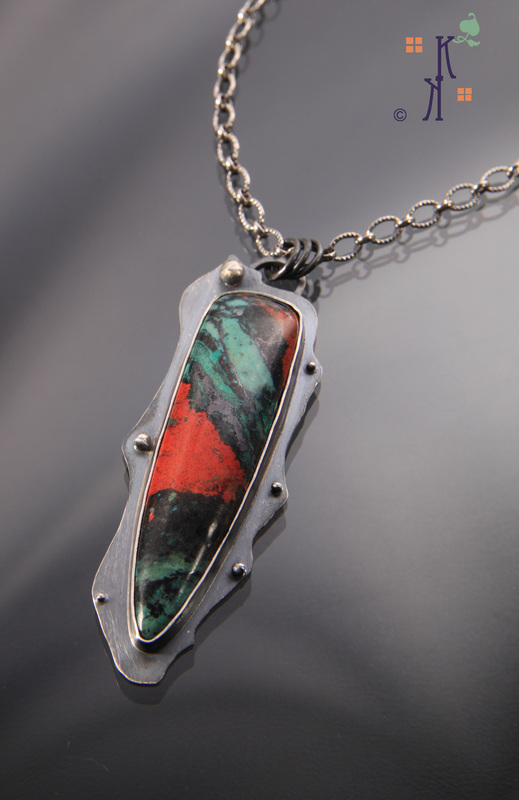 The stones are copper with chrysocolla. I purchased the lower stone a little over a year ago from Gary B Wilson. In September of 2010, I bought some more of this from him and I suspect I will add more to my working inventory as I love the subtle colors and markings that copper with chrysocolla produces. The stones are set in Sterling Silver that I oxidized, along with adding some silver balls as accents. I still enjoy making these two piece pendants. Part of me is fascinated by the construction process and I thoroughly enjoy the finished piece that has movement. I’m also caught up in this new direction with mountains as my sirens. I hope you enjoy yet another piece in my Mountainesque Series. It’s still quite frigid here in Colorado, with snow, ice, and blustery winds. If you live in the northern hemisphere, I hope you have found ways to stay safe and warm. I am thankful for the comforts our home affords us in these severe weather conditions. Another piece from my Mountainesque Series. It’s similar to the two piece styles you have seen in my Soul Searching and Timeless Series, however, when you click on the photo to see the larger view, you will be able to see the mountain outline at the top of the lower piece. Sonoran Sunrise stones where used for both components. This is one of Dan’s favorites out of this current series. The reason I have called this one Mountain Valley is because of the imagery I see in the lower stone. A rich red sky at sunset, with the outline of two mountain peaks and the green, lush valley below. As you could probably tell from my previous post about Mountainesque, I’m having so much fun coming up with designs for this new series. My goal was to have 25 – 30 pieces completed by the end of this month, however, I fell short of that target. Rest assured, there are more in the works and I’m confident I’ll have 25 – 30 piece finished by the end of February. Thanks for your time and interest in my work. I always enjoy your feedback. With this piece, I’m debuting one of my new series for 2011, Mountainesque. Why Mountainesque? I hope to explain some of that here in this post. I love mountains. They are picturesque and for the name of this series, I blended the words Mountains and Picturesque. In one of my last posts of 2010, I indicated that this year my Quest is to embrace the challenge of self-discovery and personal growth. Lexi is joining me in that Quest and I believe we are helping each other on this path to discovery. My personal word for this year is to be Fully Engaged and I believe this new series is just the tip of the iceberg when it comes to being fully engaged in creating my Art Jewelry. During the week between Christmas and New Years, I felt as though I was in a ‘waiting state’. I was reading books, listening to music, watching movies and just trying to relax my mind and actually tap into that creative channel. Lexi and I had a day where we just discussed the things we cherished, making art, our own directions. I knew the groundwork was being laid, but I just didn’t know where or when the spark was going to occur for me. And then it happened and it all made sense. It had been right in front of me and I just didn’t see it until a scene in a movie clicked with me. I was half watching the movie Wolverine while I was doing things in the studio. There’s a scene where snow covered mountains are part of the backdrop. Those mountains reminded me of the Tetons. I’m surrounded by photographs Dan has taken of them during our vacations. I love the Tetons. I love mountains! 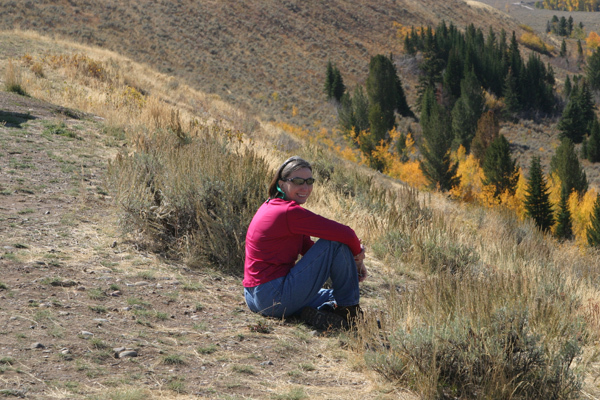 Growing up in Illinois, surrounded by corn fields….well, mountains were/are my sirens. As a footnote, I will add that I have come to appreciate the beauty associated with corn fields, but for me they fall short of the rugged majesty of mountain ranges. Why couldn’t I do something that reflected how I felt about mountains? I have never been more at peace than when I’m taking in the beauty of the Tetons. 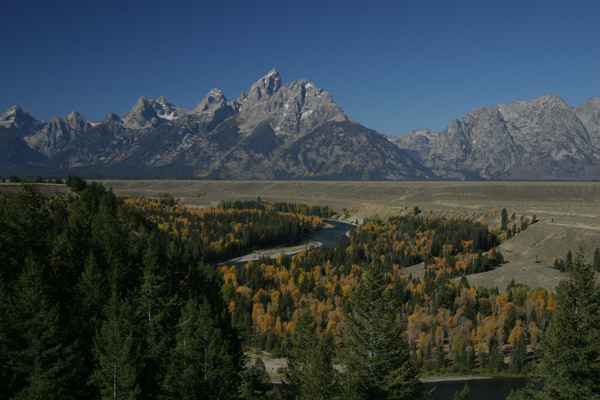 I had been drinking in the view of the Tetons while Dan was photographing them, then I felt I was being watched (you know that sensation, don’t you?) and as I turned to look, Dan took this picture of me. As I looked through my stones, it was as if I really saw what was going on in the Sonoran Sunrises (Cuprite / Chrysocolla). I saw beautiful, rugged mountain scenes! Yes, put together a series with Sonorans and silver mountain shapes. The mountain shapes can be on the side, at the bottom, the top, it really doesn’t matter, just include the graceful shape of a mountain outline. Yes, that’s it! I turned on music, our Zen channel. I drew one design after another. No shaky lines, it’s as if my hand was being guided. I’d pick up a stone, look at it and draw the shape. It felt amazing. I knew I had tapped into the channel. I just kept going. Generally, I would have the design in the first or second sketch. Everything just fell into place. Uncharted Territory was one of the first ones I drew. For me, this truly was uncharted territory. It felt real, genuine, right. I didn’t question or hesitate, I just kept going. And I’m still going with new pieces waiting for me to get to the bench to work on them. Right now I have 5 completed and there are designs for another 10 or more. I’ve even started to incorporate red jaspers in this line. This is something I’ve never fully experienced until now. It’s amazing and I’m certain many of you have experienced this and for those of you who haven’t, my advice is to keep trying, keep working, and just wait until you tap into that creative channel, because it is real and it will happen. There you have it. My love of mountains, surrounded by Dan’s photographs of them, living near them and seeing them everyday….it was right there, in front of me all that time and I finally saw it….just by that 3 second clip from a movie I was barely paying much attention to….I always have something running in the background as I work in the studio. You never know where your next idea will come from or how, but I truly believe the most important thing is that you are open to receive it when it comes. I’ll leave you with one more from this new series, which I call Safe Passage. As this line continues to grow and develop, I will post photos and details.